How do Georgians fare by comparison? Actually, Georgians seem remarkably well informed. In late 2007, in the run-up to the Presidential Elections, Jonathan K. suggested to us to include some questions in our pre-election survey (the entire effort was done in seven days, so even the slides don't quite match the standards we have today). As you can see, we had about 15% of respondents getting questions of national importance wrong. However, many respondents were willing to confess that they "don't know" the right answer, a healthy attitude we have also seen in other surveys. View more presentations from crrccenters. We know that public opinion is imprecise once we get into details: try and find out how Georgians look at detailed constitutional arrangements (sharing tax revenue between central and local government, Presidential versus Parliamentary system, that type of stuff) and you get the expression of a general desire for balance. Many respondents can't necessarily keep the Council of Europe and the European Union apart, but this is hardly surprising. Also, back when this was a topic, respondents struggled to distinguish NATO membership from the Membership Action Plan. In the end, we did find Georgian respondents so informed that we stopped asking knowledge questions. 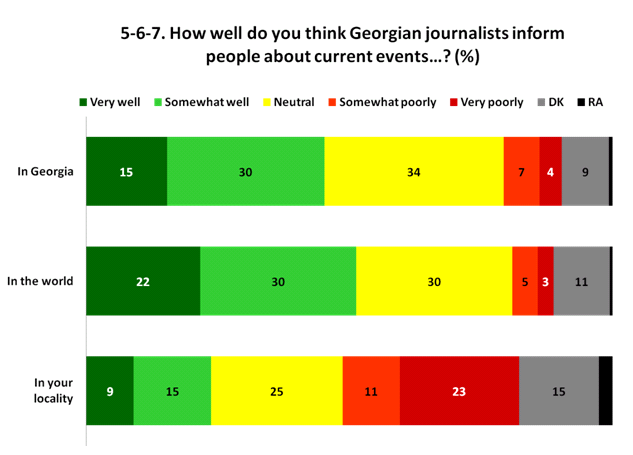 According to more a survey conducted in October 2009, Georgians don't think that it's the bigger national and international issues they are not informed about. It's things that happen in the other part of town that the media doesn't cover sufficiently. Note one important difference between these opinion surveys: the American polls mostly are conducted on the phone, and may have a bored respondent paying insufficient attention. Moreover, the polls with surprising results capture a disproportionate amount of the attention. So one should not overstate the US results. The Georgian surveys are conducted face-to-face, and respondents are more likely to struggle to find the right answer.